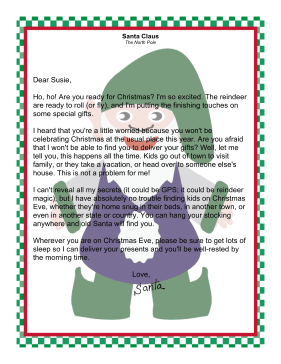 When a child is away from home during the holidays, he or she might worry that Santa Claus won't be able to find him or her on Christmas Eve. This letter puts those concerns to rest. Ho, ho! Are you ready for Christmas? I'm so excited. The reindeer are ready to roll (or fly), and I'm putting the finishing touches on some special gifts. I heard that you're a little worried because you won't be celebrating Christmas at the usual place this year. Are you afraid that I won't be able to find you to deliver your gifts? Well, let me tell you, this happens all the time. Kids go out of town to visit family, or they take a vacation, or head over to someone else's house. This is not a problem for me! I can't reveal all my secrets (it could be GPS; it could be reindeer magic), but I have absolutely no trouble finding kids on Christmas Eve, whether they're home snug in their beds, in another town, or even in another state or country. You can hang your stocking anywhere and old Santa will find you. Wherever you are on Christmas Eve, please be sure to get lots of sleep so I can deliver your presents and you'll be well-rested by the morning time.